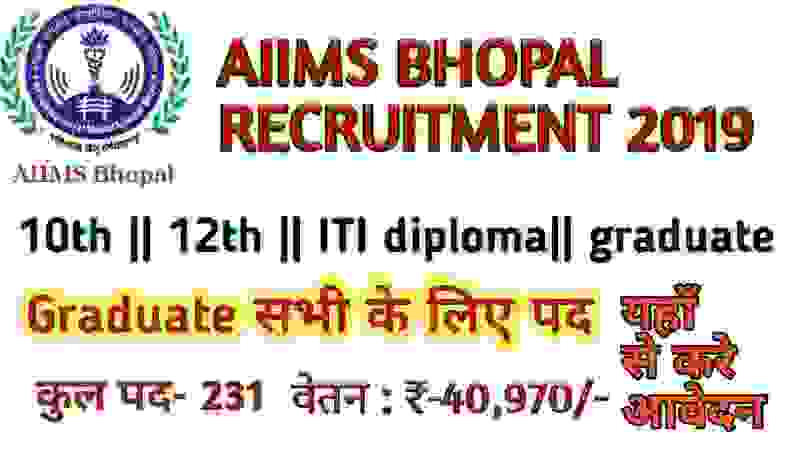 AIIMS Recruitment for various Non-Faculty member posts in Bhopal. AIIMS introduce an official notification which you can easily find on the AIIMS Bhopal website, we also share the direct link for that PDF file under IMPORTANT LINK Segment at the last of this article. In their official PDF File AIIMS introduce the 231 total vacancies under various job profiles which are going to be filled up through this AIIMS Recruitment process 2019. • Before applying, candidates should ensure that they fulfil the eligibility conditions for the post. 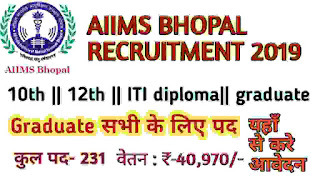 AIIMS, Bhopal would call all the applicants who had applied for the post with the requisite fee for the MCQ test and shall determine their eligibility only at the time of selection. (i). B. Sc. in Medical Lab Technology or equivalent. (ii) Five years’ experience in the crelated field. Those applicants who have a Diploma in Pharmacy line from a documented University/Institution can apply. 12th Class pass can apply for these Stenos job profiles. B.Sc. in Medical Records can apply. 12th pass in Science stream only from a recognized board with At least 6 month Diploma/Certificate course in Medical Record Keeping from a recognized Institute / University. i). Those who pass in their 10th Class examination. (ii) ITI Diploma Certificate in Electrician Trade. Candidates having a diploma In Pharmacy from a recognized University/Institution. Only 12th pass applicants in Science stream with minimum five years’ experience in Medical Gas Pipeline System in a 200 Bedded Govt. Hospital. 12TH pass can apply for these Government jobs in India. (i) 12th pass with science stream. (i) 10th Class pass or any other equivalent qualification. (iii) 5 years in electrician trade. Those who have completed their Graduation from a recognized university and have at least 1 year experience in handling stores. (ii) ITI/Diploma certificate in Refrigeration and Air Conditioning from a recognized institute/Polytechnic. (iii) 2 Years of experience. You have to pay the application Fee through Demand Draft only payable at Bhopal addressed to The Director, AIIMS Bhopal and is to be submitted with the application form.